Today, I am here with an in-depth review of the two newest patterns to hit Stitchwerx Designs' pattern shop -- the Lane Raglan Tee and Tunic & the Essential Leggings! It's not often that I get the chance to sew something so versatile, so comfy, and so essential in my daughters' wardrobes. 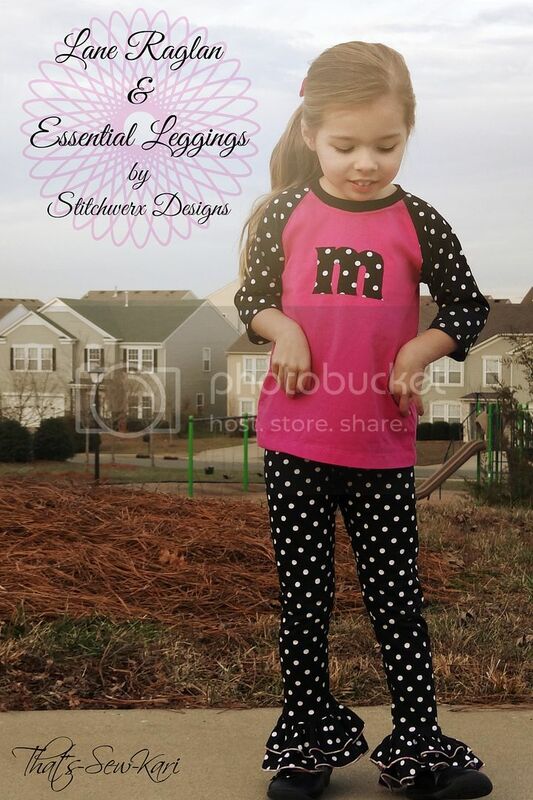 Don't get me wrong, they love the dresses I've made them, but the Lane Raglan Tee & Tunic and Essential Leggings by Stitchwerx Designs are great for everyday play. 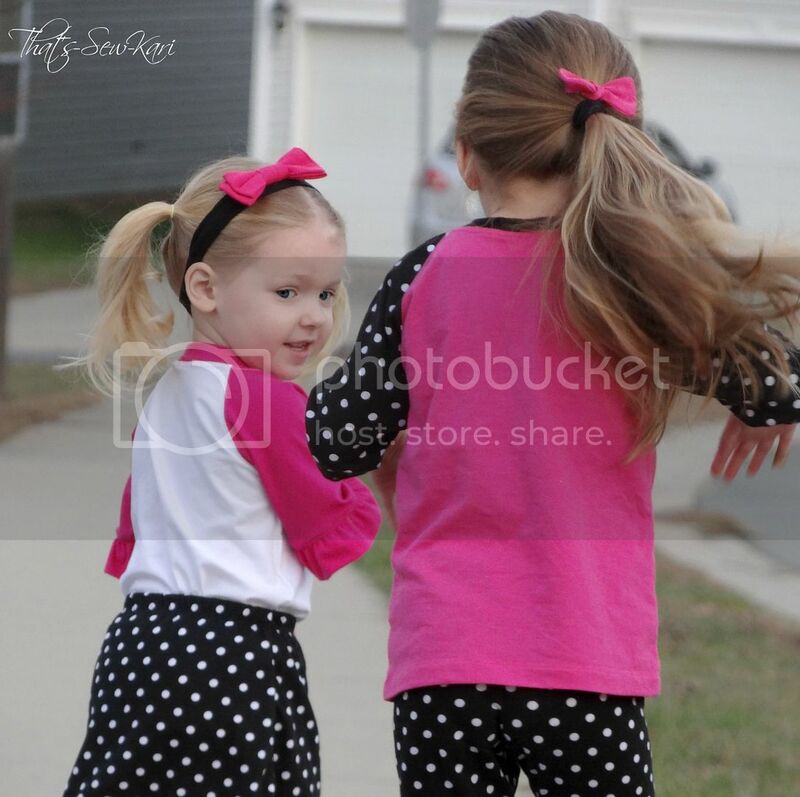 I am on the newer side of sewing knits so I have usually "cheated" and bought my girls their play clothes...until now! I first met up with Kim of Stitchwerx Designs when she asked me to test her Rosemary & Thyme Pants mid-summer. 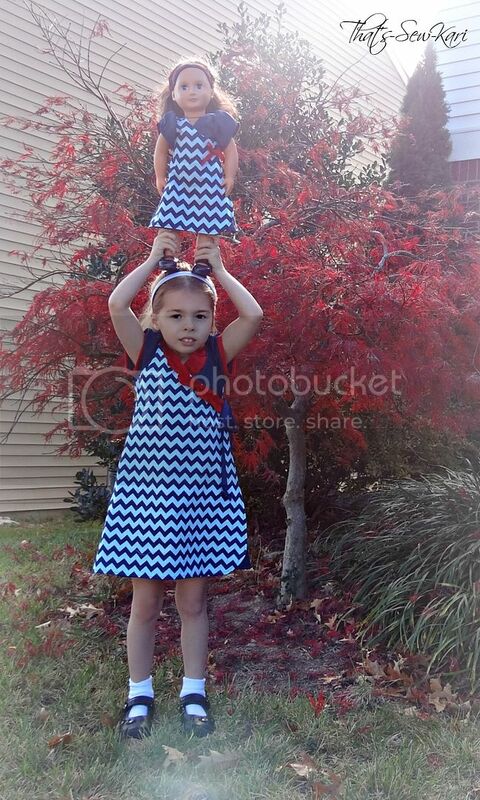 They turned out super cute and my testing experience with her was really great. I was bummed when her latest round of pattern testing fell during a visit from family. I'm always looking to expand my knowledge in the world of sewing knits and knew her thorough patterns could teach me a thing or two. Kim came up with a great idea - instead of testing, would I be willing to review the patterns after their release? And since you are reading this, obviously my answer was YES! 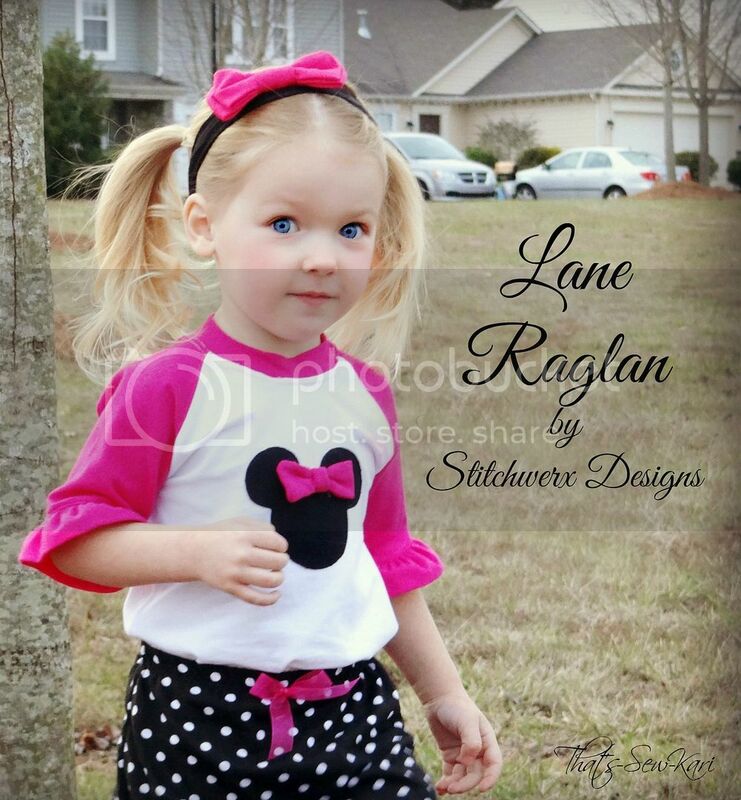 Without further ado..... let's start with the Lane Raglan Tee & Tunic. 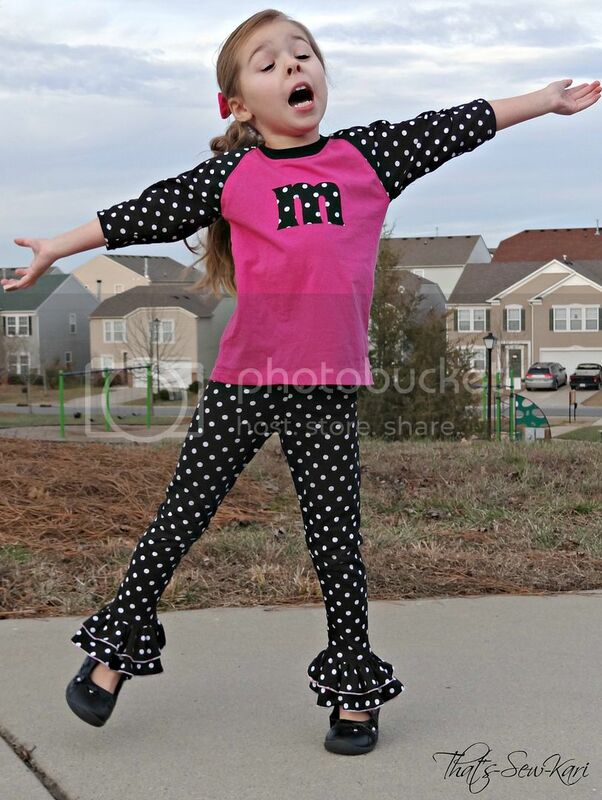 When I first started designing my 4 year old's outfit, I new I wanted to incorporate some pink and her initial -the front of the Lane Raglan is great for applique work. I used some Jersey knit (I used a Lycra blend for the neck) from Hobby Lobby that had *just enough* stretch to it to work with this pattern. I decided to make the Tee length so she could choose whether to wear leggings or jeans with it. And I thought that the 3/4 sleeve length would be the most versatile to take us throughout the year. 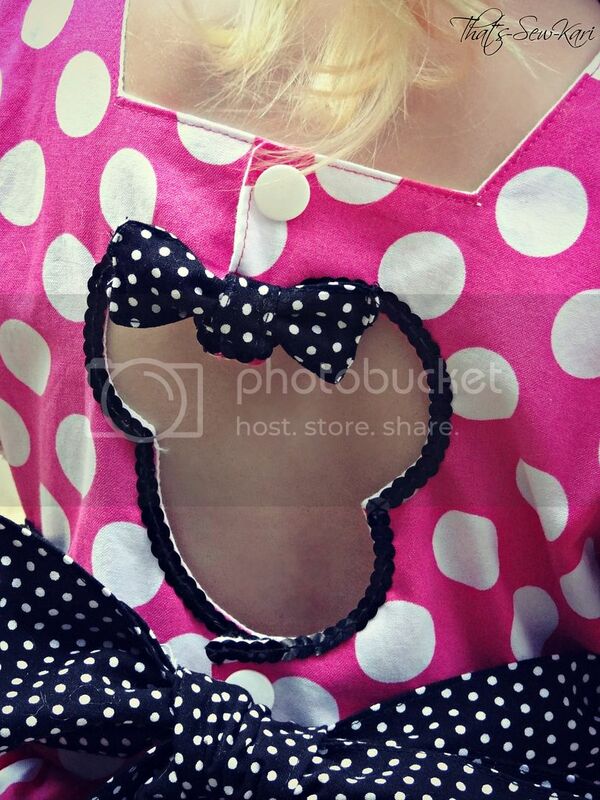 Of course, my 2 year old would feel left out if she didn't get a new shirt! 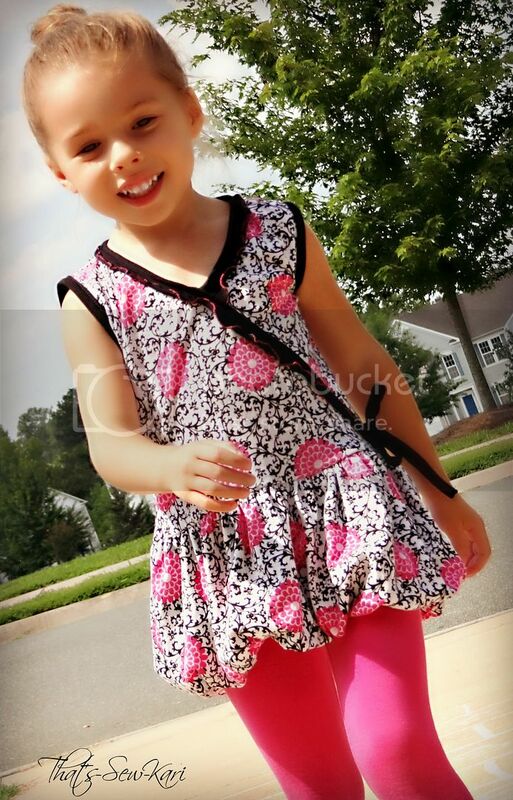 And, I needed a new shirt to match a new skirt I just made her for a different pattern review (coming soon!). 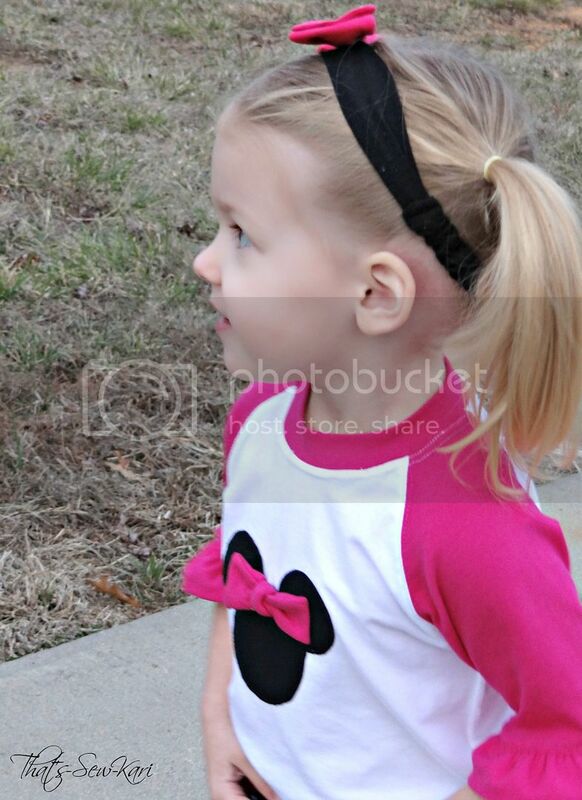 She loves all thing Minnie Mouse and I knew the front of the shirt was perfect for a Minnie Mouse applique. 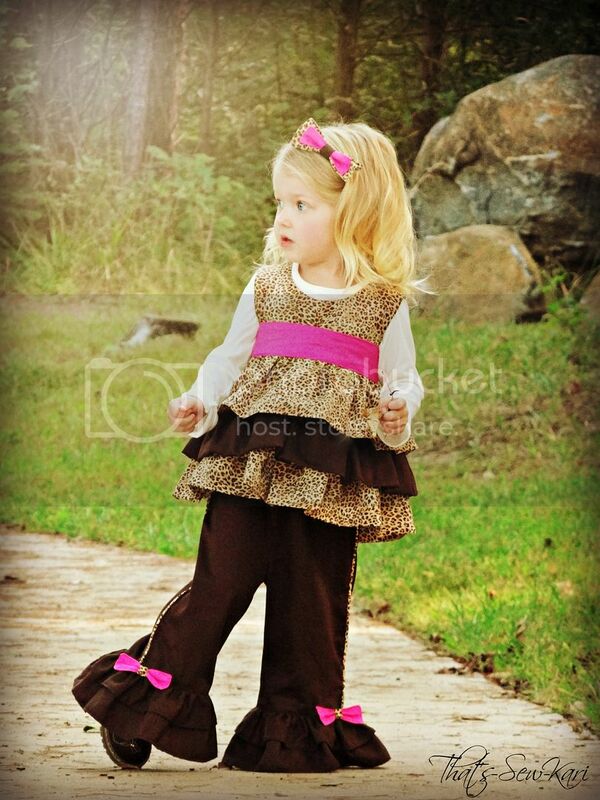 Because I apparently make skinny kids, I looked up her measurements on the included sizing chart and determined she needed 18 mos with the length of 2T. I decided to do short sleeves, but added a fun ruffle at the bottom of each sleeve (not included in the pattern). I made this shirt using a cotton/Lycra blend from the clearance tank tops I scored from Walmart at the end of the season. Bonus: I made sure I placed the pattern pieces just right on the tank top to reuse the original hem! 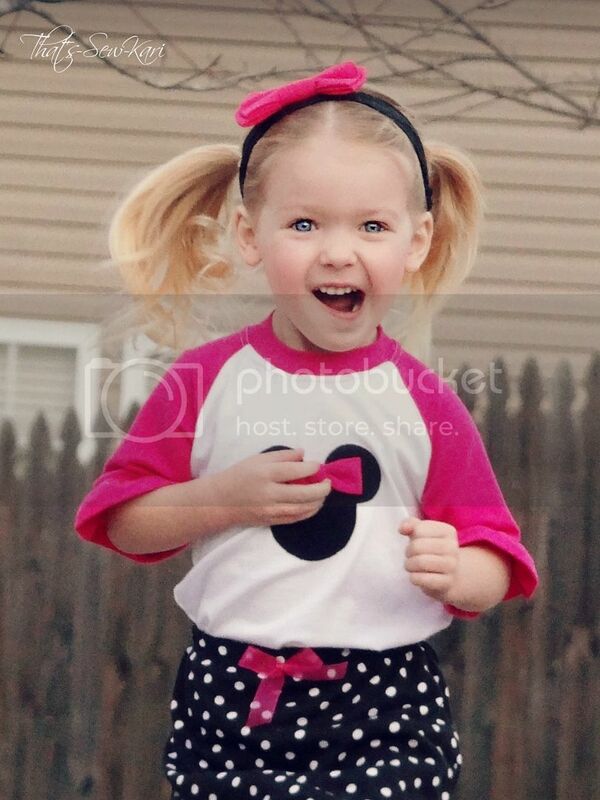 She was positively giddy about her new shirt! You think she likes it?! Although my serger does have the coverstitch function, I used the faux coverstitch with my twin stretch needle on my regular sewing machine as described in the pattern. I, unfortunately, didn't have matching serger thread to try the coverstitch (and I was scared to rethread....HA!). The pattern is very thorough with lots of tips to help you through, especially if you are new to sewing knits. I did run into a snag with the first neck binding I sewed. I forgot to stretch it as I top-stitched.... and well, pictures had to be rescheduled! The pattern does not include a cutting guide for the neck binding piece (gives width only) , but does show you how to get a proper fit since it (the length measurement) could vary depending on how much stretch/recovery your knit has. I was a bit unsure of what 20-25% stretch looked like while I was placing the neck, so I fit it without stretching and then found the 3/4 mark and then added an inch for seam allowance. Perfect fit. This brings me to my review on the Essential Leggings! 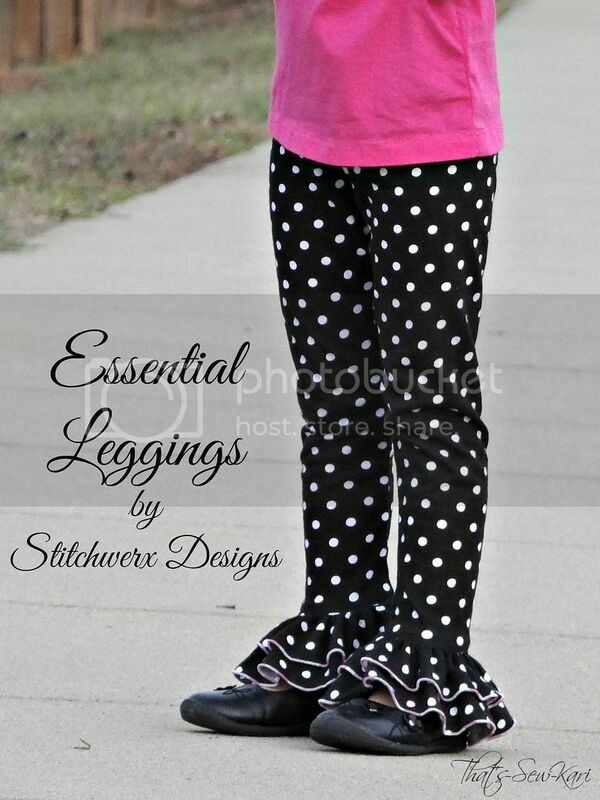 These legging are so easy to make! I chose ankle length with a set of double ruffles. 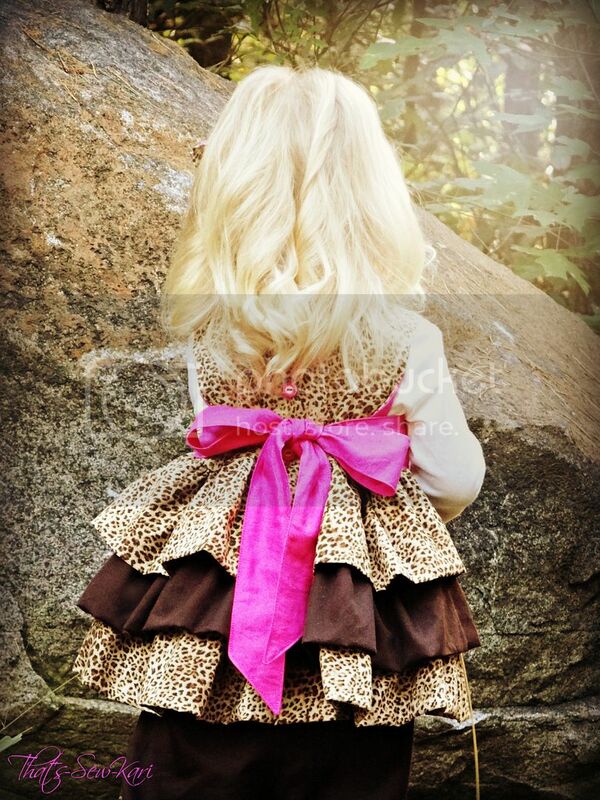 I have 2 girly-girls and you can never go wrong with adding a ruffle or two! I used the same Jersey Knit from Hobby Lobby for these leggings. 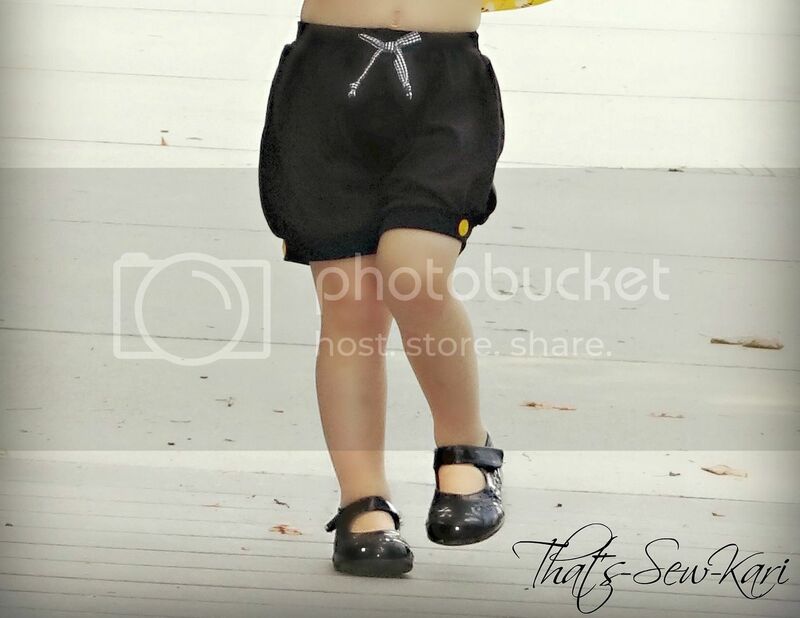 After consulting the size chart included in the pattern, I cut out the size 3T with the length and the rise of 4T. For the bottom of my ruffles, I used my serger for a rolled hem, but you can either skip the hem (as knit doesn't fray) or do a traditional hem if you prefer. I'll let the pictures speak for themselves as the fit is about as perfect as you can get! My next pair, I will make with a Lycra blend since the Jersey doesn't have the best recovery and the knees may become a bit saggy. BUT, my daughter loves them! Separate rise for the back: perfect fit! Both of these patterns are a great addition to your pattern library -- I foresee some new pjs, sweatshirts, tunics and lots more tees and leggings in my future! ADDED BONUS: These patterns are still in the special bundle pricing of just $10 through Dec 22nd! You can find the bundle HERE on Etsy. Don't delay! Christmas Comes Early to Candy Castle Patterns!! Squeeeeee!!!!! I am bursting with excitement today. It feels like Christmas for Candy Castle Patterns fans. 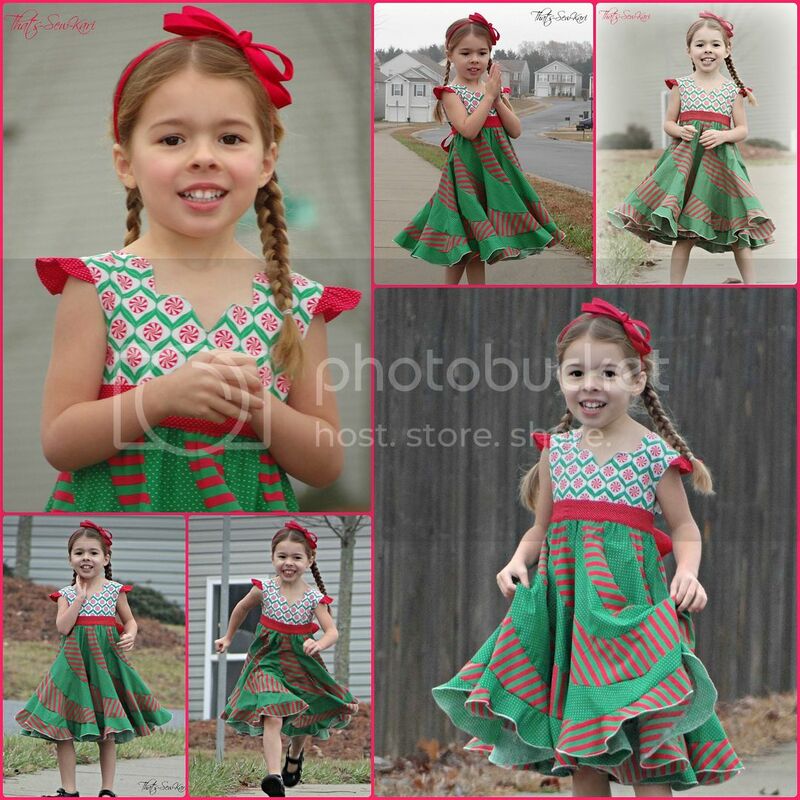 Today is not only the release of the highly anticipated Peppermint Swirl Dress, but also the debut of the new Candy Castle Patterns website! 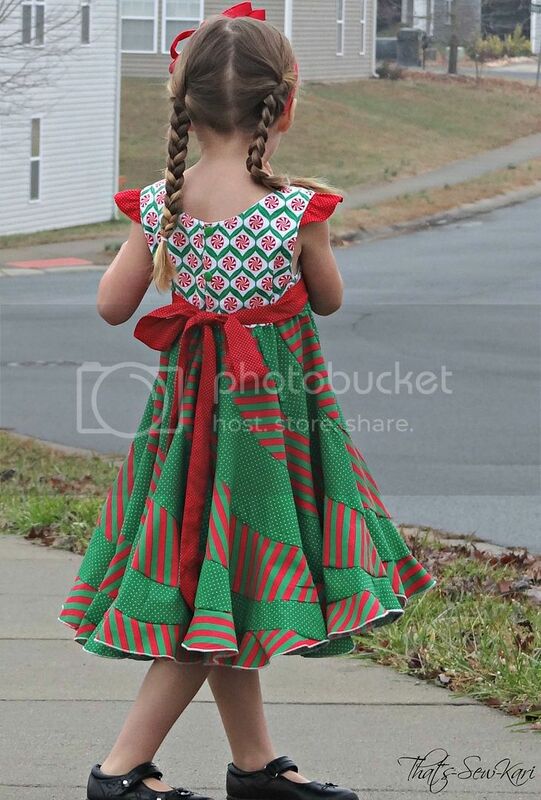 About a month or so ago, in the Candy Castle Patterns Group, we were shown a sneak peek of the Peppermint Swirl Dress.... and it was love at first sight!! This showstopping dress has a gorgeous petal neckline, flutter sleeves and flounces upon flounces in the skirt for maximum twirlablity! Immediately, my mind was swirling with ideas. 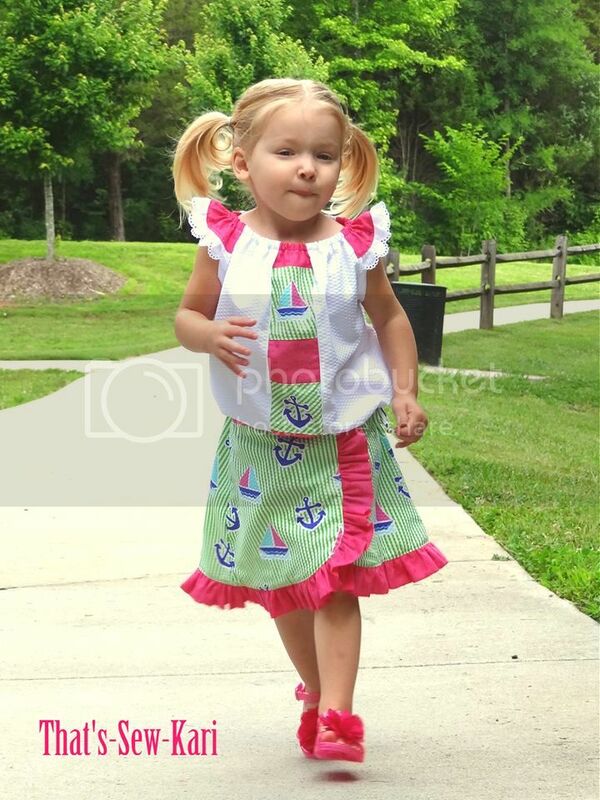 The skirt contains 14 flounces (or more if needed for your color scheme) which is the perfect number of flounces for a rainbow dress. 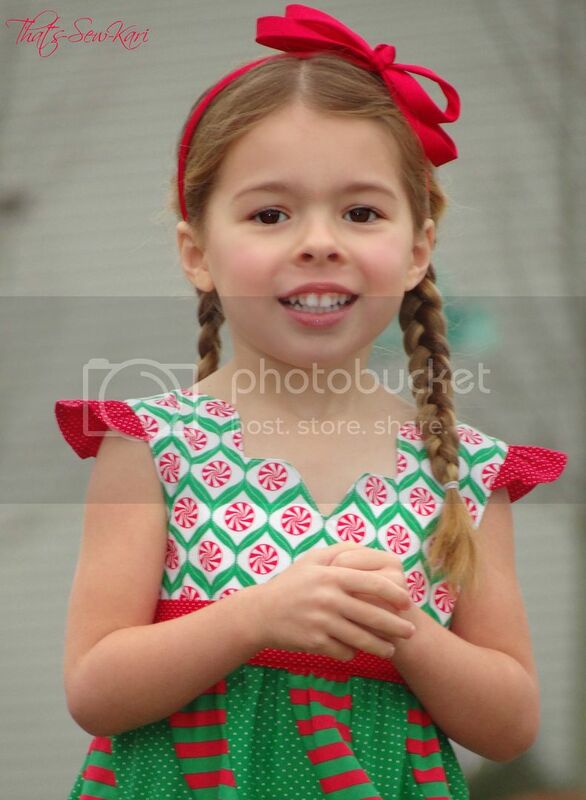 I was set on this idea for weeks, until I ran across "Peppermint" fabric at the store. I HAD to have it!!! 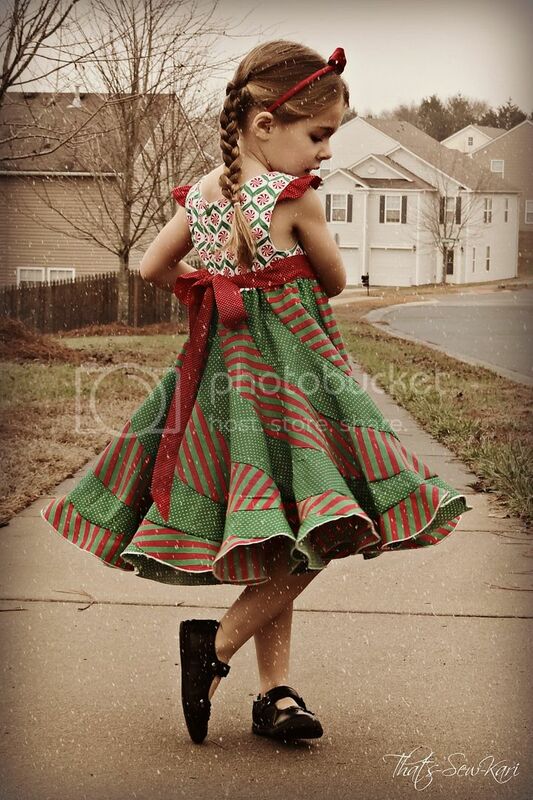 It is perfect for Christmas and my 4 year old needs a super fun dress for school Christmas parties. I even made it snow here in the South! 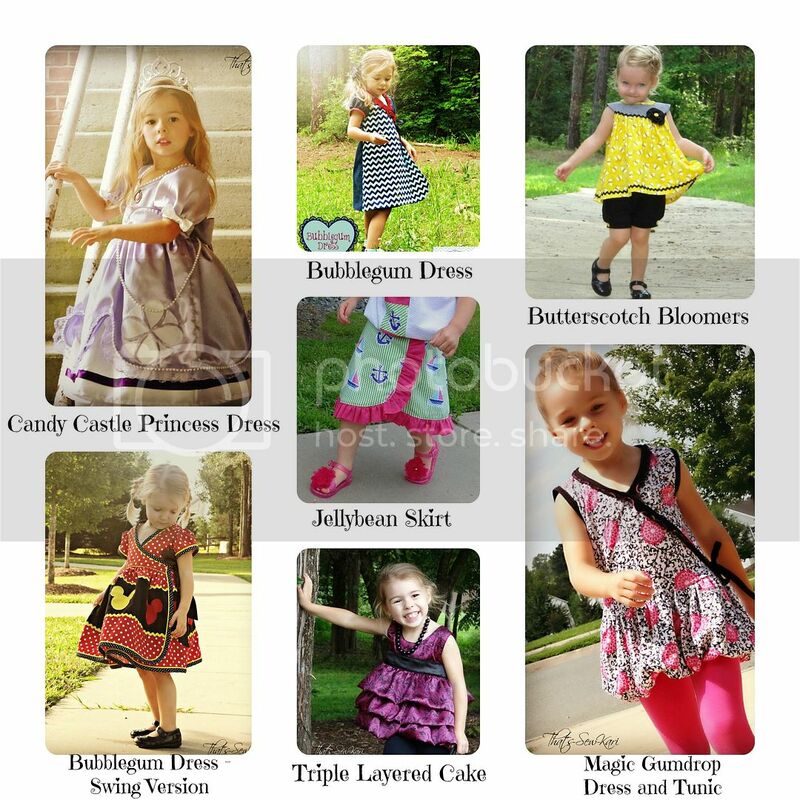 A choice of flutter sleeves, sleeveless, or you can use any sleeve (long slim sleeve, 3/4 sleeve, or short, puffy sleeve) from the Candy Castle Princess Dress pattern! Sewing this dress isn't nearly as hard as it looks! I think it took me about as long to cut as it did to sew. If you stack your fabrics on top of each other, you can cut even faster. I actually cut my pieces one at a time. No pins required for sewing the flounces together or for hemming!! Ahh, such freedom :) If you have a serger, it does make construction faster, but totally not necessary. Oh, and the twirl!!! 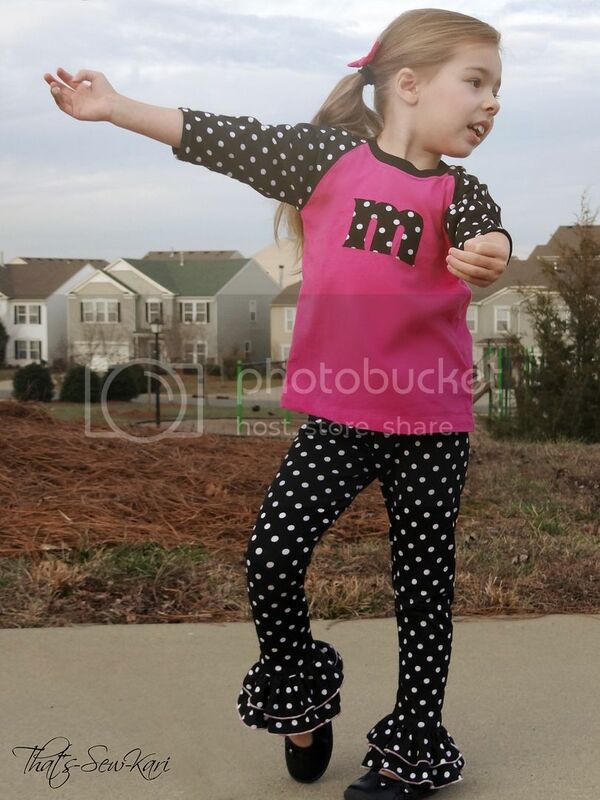 YES, look at the twirl! If you can believe it, this is a 22-FOOT hem on this showstopper (this is the size 3)! Just marvel in all its glory! 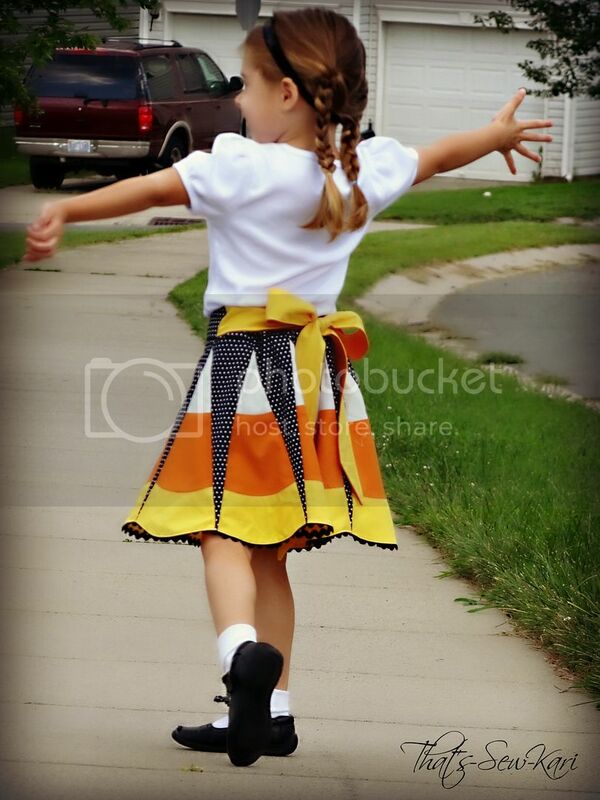 She didn't want to stop twirling!!! 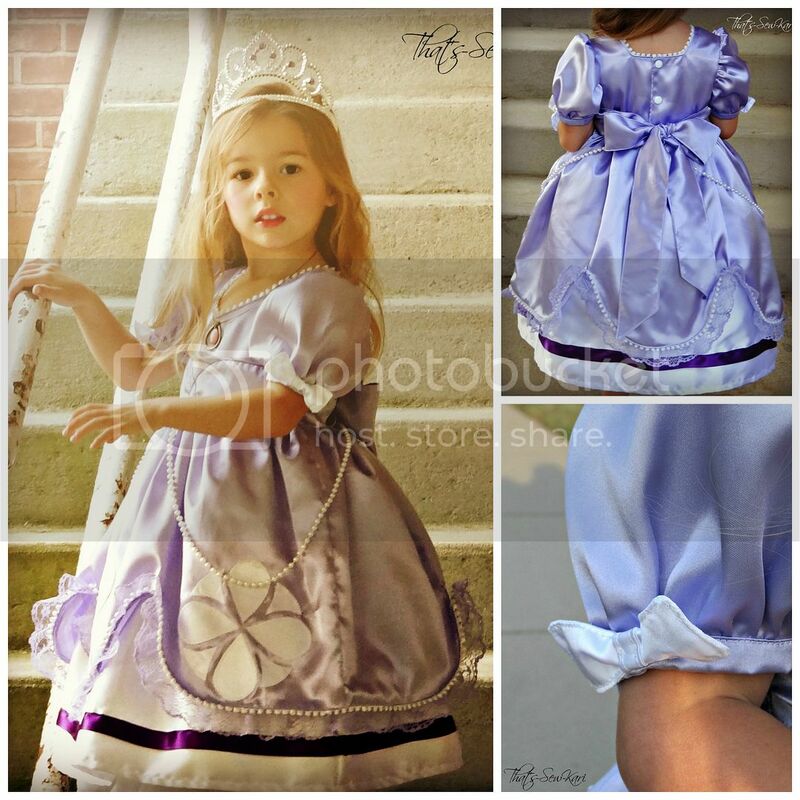 To celebrate its debut, Candy Castle Patterns is offering a sale (RARE!) when you purchase at least one additional pattern. Use the code peppermint during the checkout process at www.candycastlepatterns.com to save 20% when your purchase is at least $15. Don't delay, though, because the sale ends Sunday, December 8th at precisely 11:59pm MST. Happy shopping and happier sewing!!! Come show off your creations in the Candy Castle Patterns Group! Next up is a matching one for my 2 year old who is sad that hers isn't sewn yet... and then rainbow ones!! I am so excited to be able to share this secret! 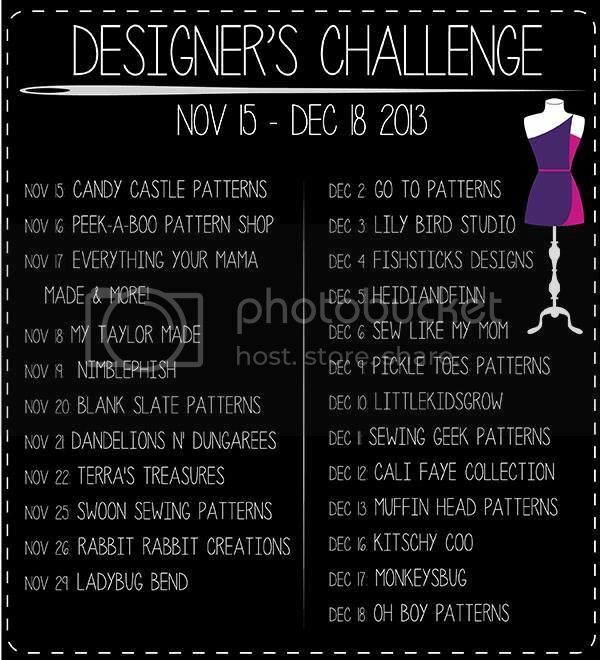 Today, Candy Castle Patterns is kicking off the Designer's Challenge Series. This is a series where each day, a new designer releases a new pattern that is challenging to them in some way, whether it be completely out of their normal design style, an outside-the-box idea, or just plain difficult. 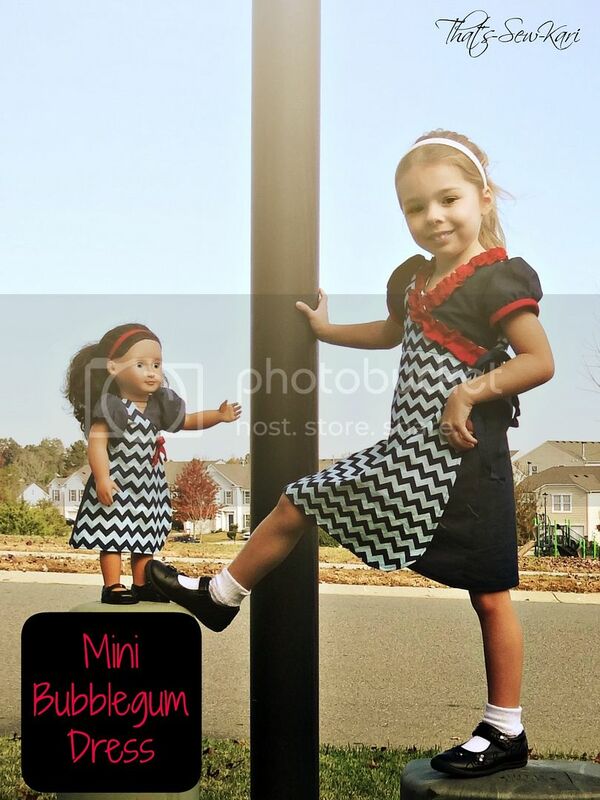 I present The Mini Bubblegum Dress and Swing Dress Doll Pattern! Yep, that's right!!! 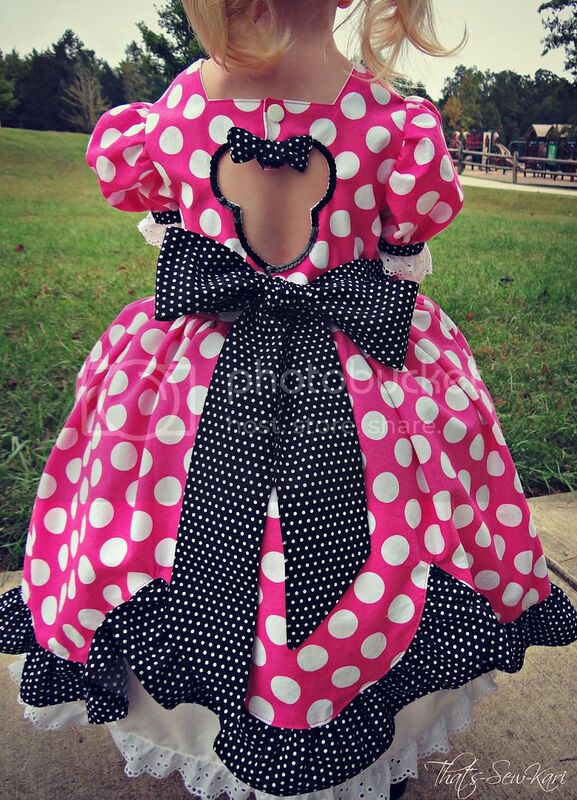 Now, my girls can dress their dolls in matching Candy Castle Patterns dresses! I had so much fun being part of a super secret testing process. AND, the testing process was where the designer behind Candy Castle Patterns discovered even more challenges than she originally anticipated. You see, she lives halfway across the world where 18" are scarce (read: none!) and she had to import one. 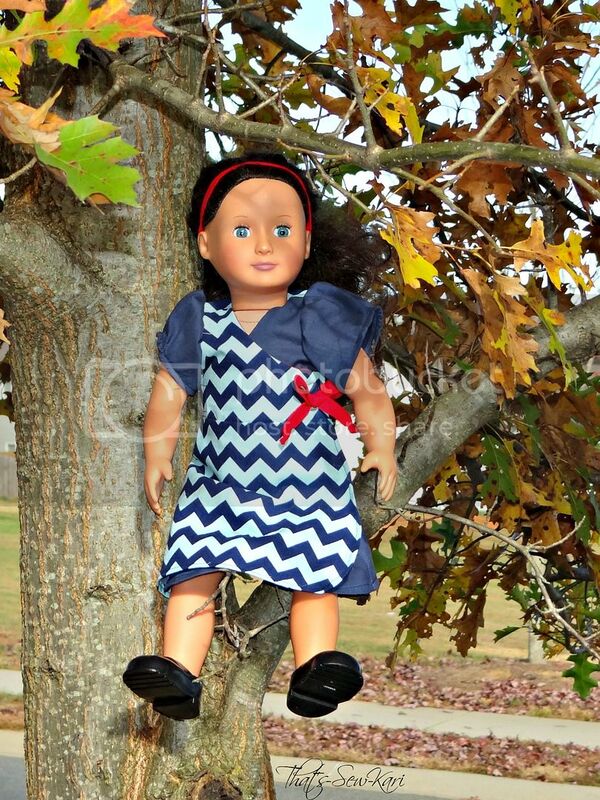 So she got her doll and got to work and the Mini Bubblegum Dress and Swing Doll Dresses were born. 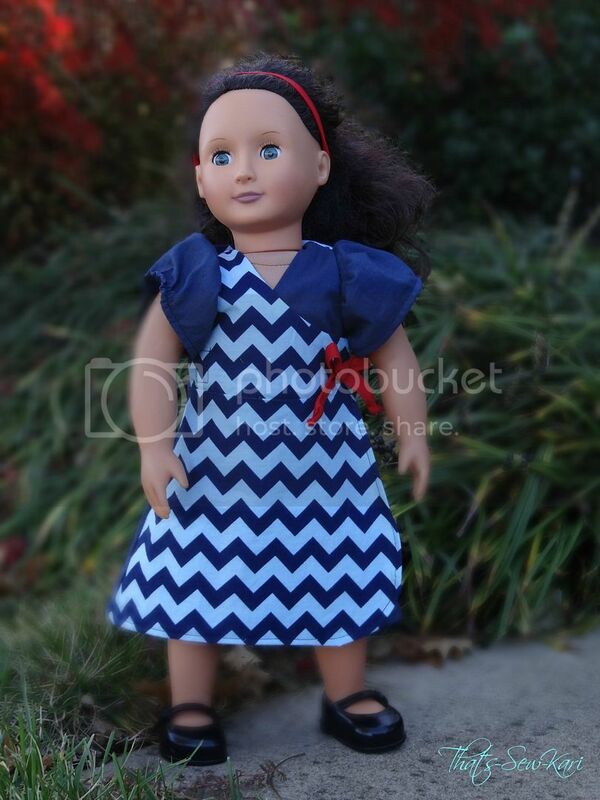 So, to add to the challenge, she had to redesign the pattern using my doll, on the other side of the world. Thank goodness for modern technology and Candy Castle Pattern's ability to design because the result is a perfect fit!!! 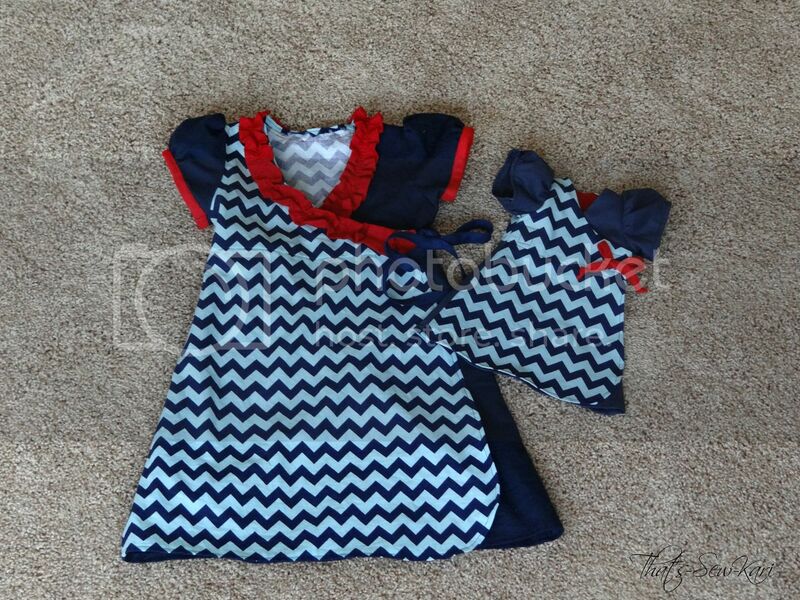 The Mini Bubblegum Dress and Swing Doll Dress each have a hemmed version and a bias-trimmed version. Because I was trying to get as close to a replica of my daughter's dress, I chose the hemmed version of the original Bubblegum Dress. 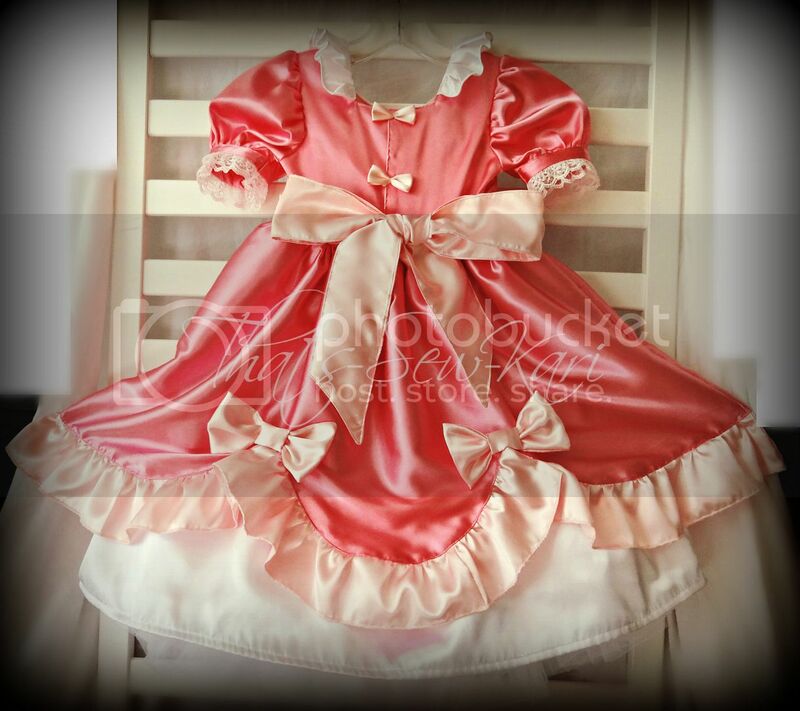 The construction is very similar to the Bubblegum Dress and Swing Dress, but the doll version also has the option of a velcro closure instead of ties. I chose the velcro closure as my 4-yr old isn't quite to tying bows yet and this would allow her to play independently. 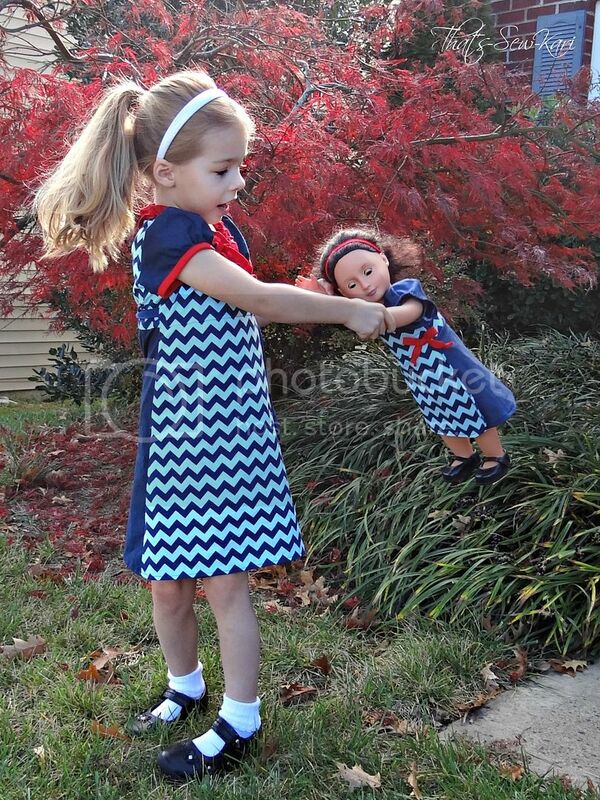 The Mini Bubblegum Dress and Swing Doll Dress is on sale for just $4 through Sunday HERE! Join the Candy Castle Patterns Group on Facebook to get all the inside details on what's coming next! Adobe has updated some settings and it may affect your PDF pattern pieces when you print them out. Candy Castle Patterns and I have teamed up to help you understand these changes. After you print your patterns, ALWAYS be diligent amd MEASURE the test square provided to make sure it measures EXACTLY correct! This issue came up in a pattern test when more than one tester failed to measure their test sqaure prior to cutting their pattern pieces and sewing. A fellow tester, Cori mentioned that Adobe had updated and was likely the cause. 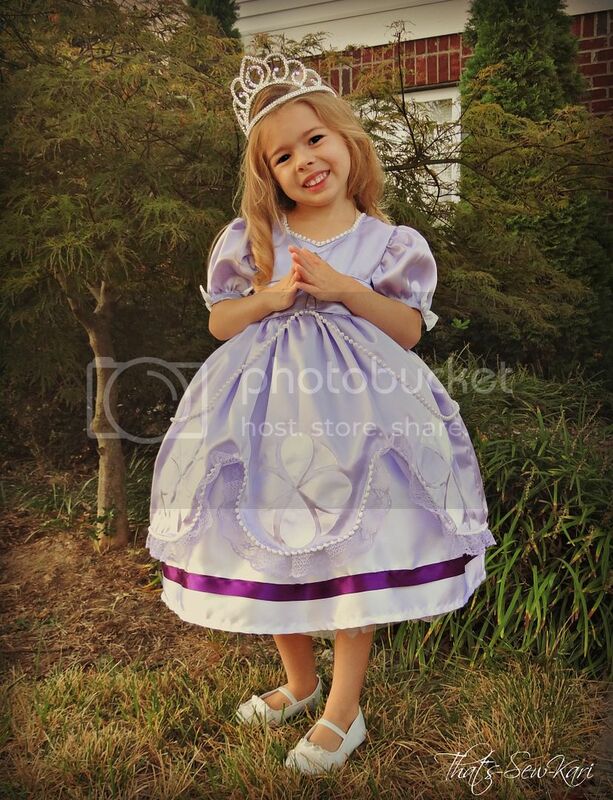 Thank you Candy Castle Patterns for turning my pictures into a PDF tutorial! The tutorial has also been shared on Pattern Revolution where I am a contributor! I've heard from several fellow seamstresses who admitted they never measured their test boxes - take the pledge to measure, measure, measure!! Click the picture to access the tutorial! 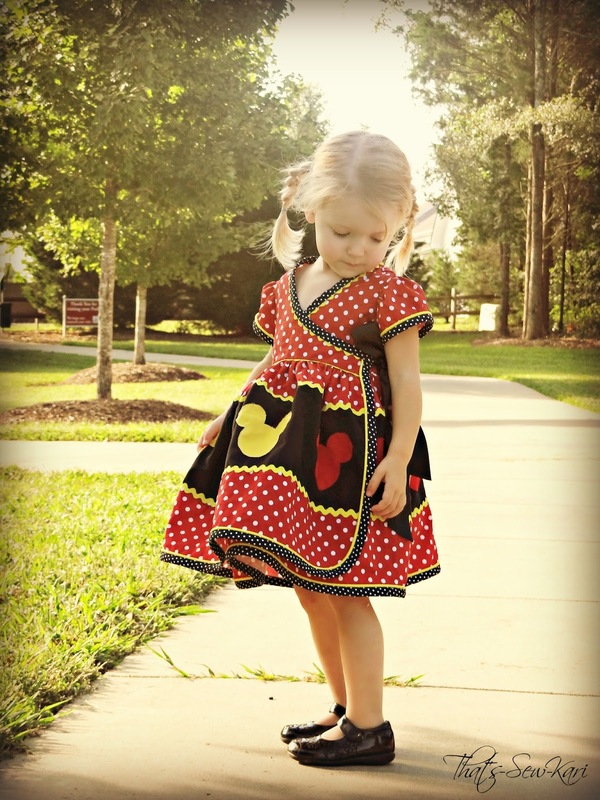 This pattern was designed by Tricia Boyer, exclusively for Little Lizard King. It’s a modern take on a vintage-style apron and it is EPIC. In the weeks leading up to the test, we were told that this skirt was BIG, FUN, and beyond EPIC – and boy, were they right! 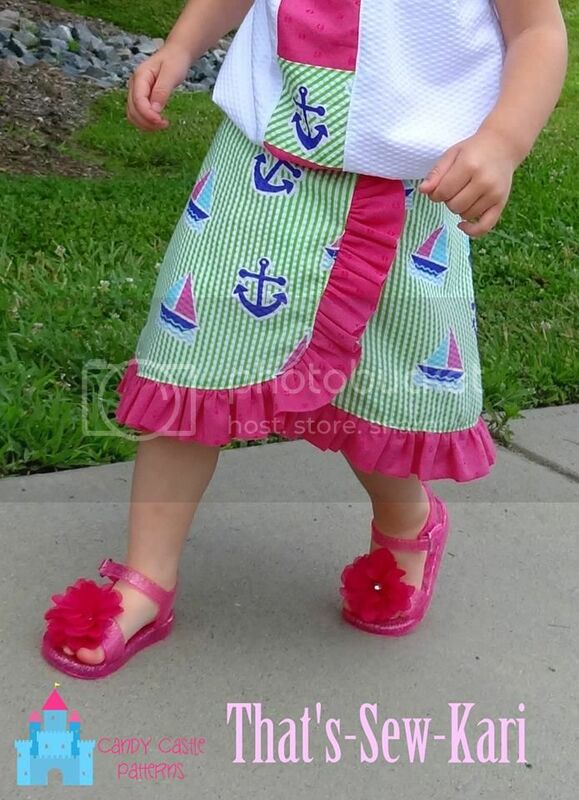 It’s a playful skirt, with 10 scalloped panels pieced together with 10 upside down triangles, a flat waistband in the front and an adjustable waist in the back, rick rack trim and a huge bow that can be worn in the front or back. 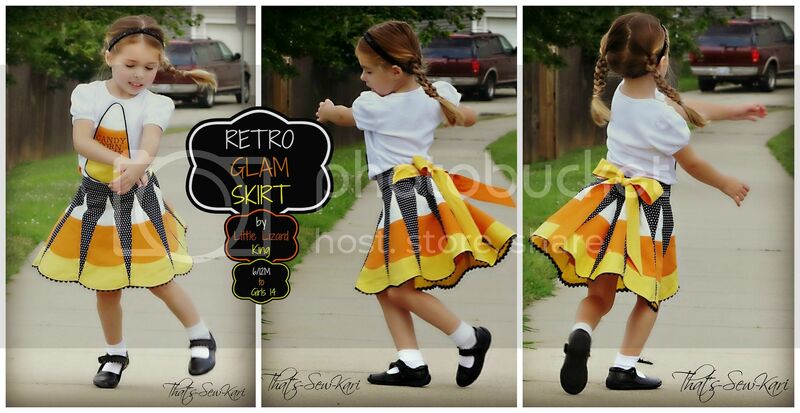 As soon as I saw a sample of the Retro Glam Skirt, my mind was racing with possibilities. I have tested alongside some of the other ladies picked and they are all so talented. I began to think outside the box a bit. I really wanted to show the playful possibilities of this pattern. 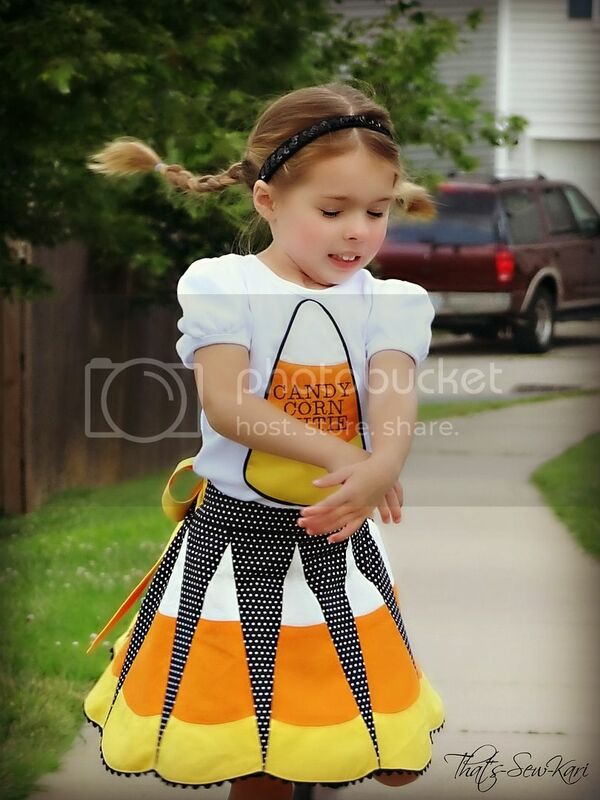 Enter the “Candy Corn Cutie” edition of the Retro Glam Skirt. Seeing the scalloped pieces on the skirt, I couldn't get the images of candy corns out of my head. In my mind, my idea looked awesome. I decided I was going to keep my idea under wraps and give Tricia (designer) a few teases of my own. Okay, several. 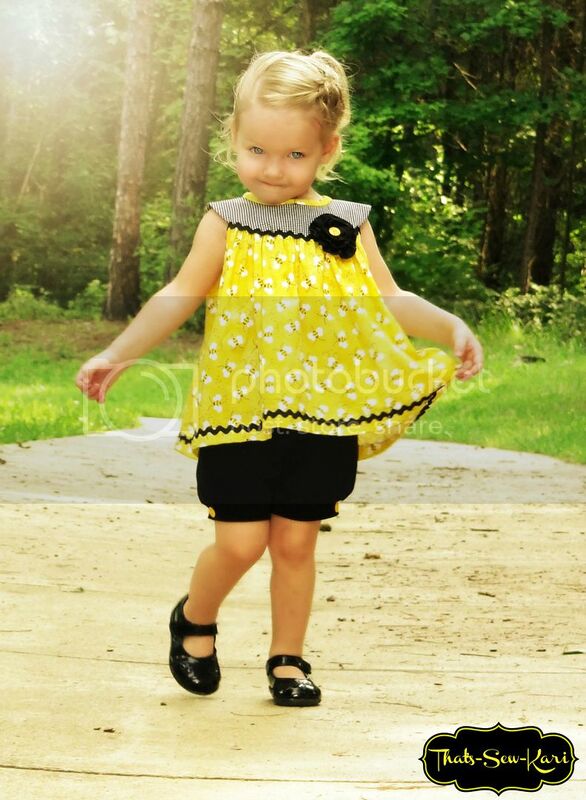 I think I strung her along for several days because once I got the skirt finished, I had to make a matching shirt. 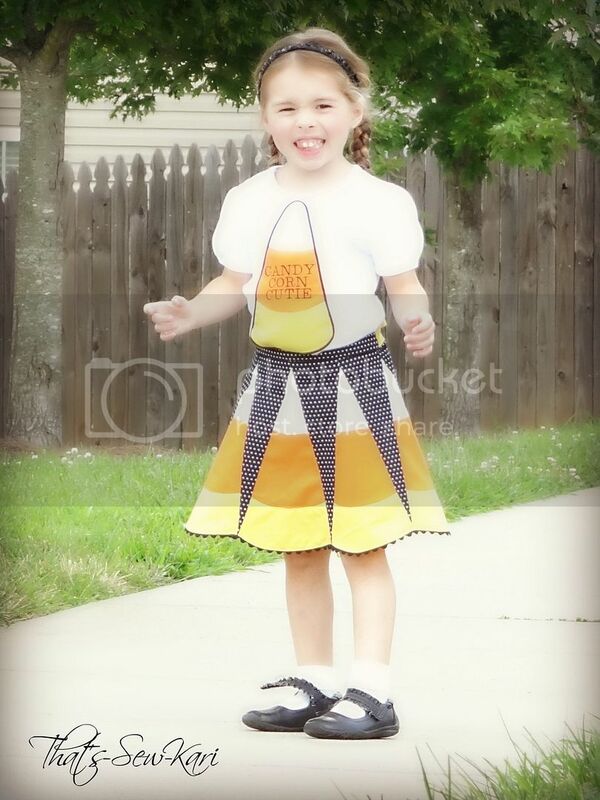 I used 3 Kona solids – yellow, orange, and white – to make the candy corns. 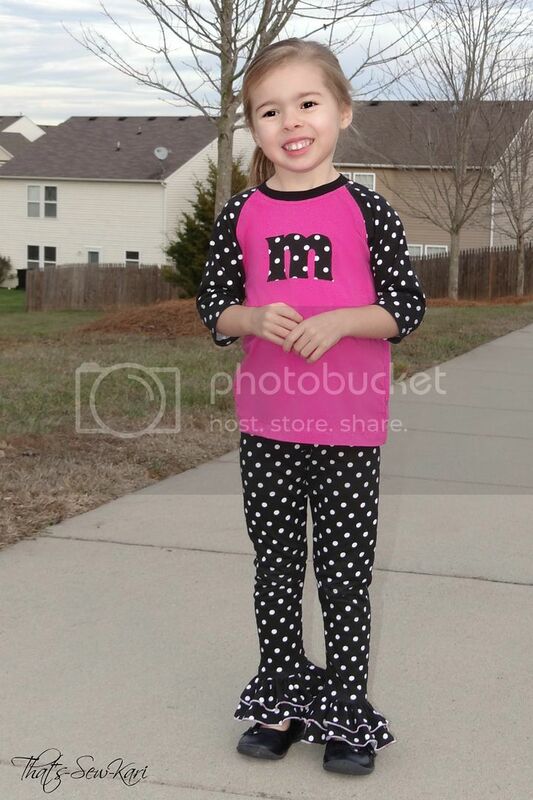 Then, I chose a black fabric with small white polka dot to give stark contrast to the 10 candy corns. I finished the bottom with black rick rack to tie in the black fabric and really continue the outlining of the candy corns. 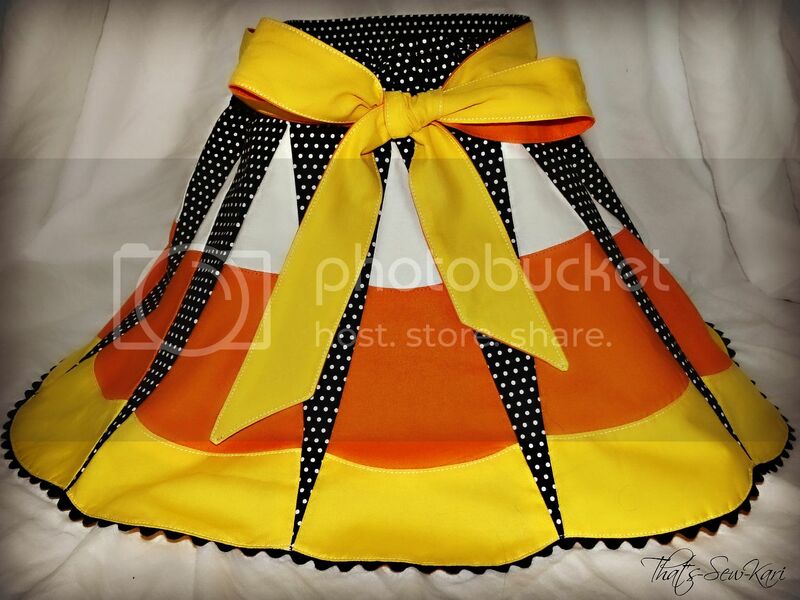 For the bow, I went back and forth between several ideas and finally settled on a two-tone bow – yellow and orange. 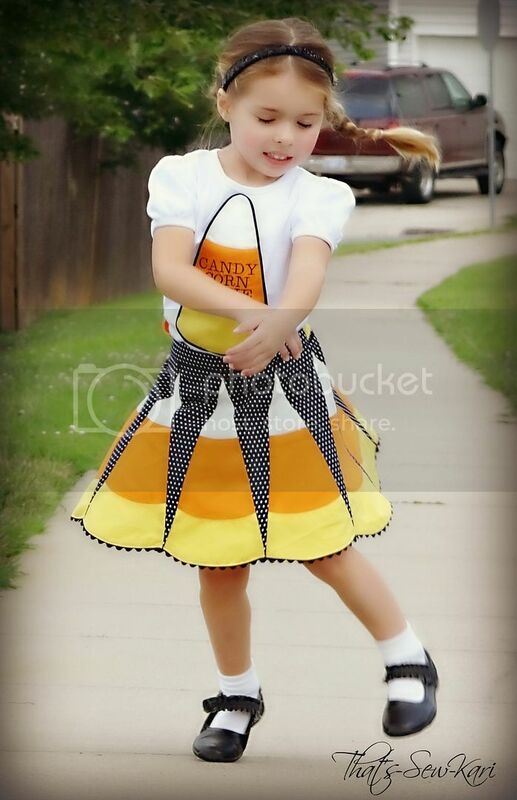 Once I got my candy corns pieced together, the construction of the skirt went fairly quickly. I was a bit nervous at first because of all of the piecing together, but the pattern pieces were spot on and I had no issues. I really like that this pattern prefers that you use buttonhole elastic to cinch up the waistband. I had some on hand, but it’s simple to make and the pattern walks you through it. My daughter has a smaller waist than most her size so this was perfect. It makes sewing on the waistband easier too since you add the elastic last. 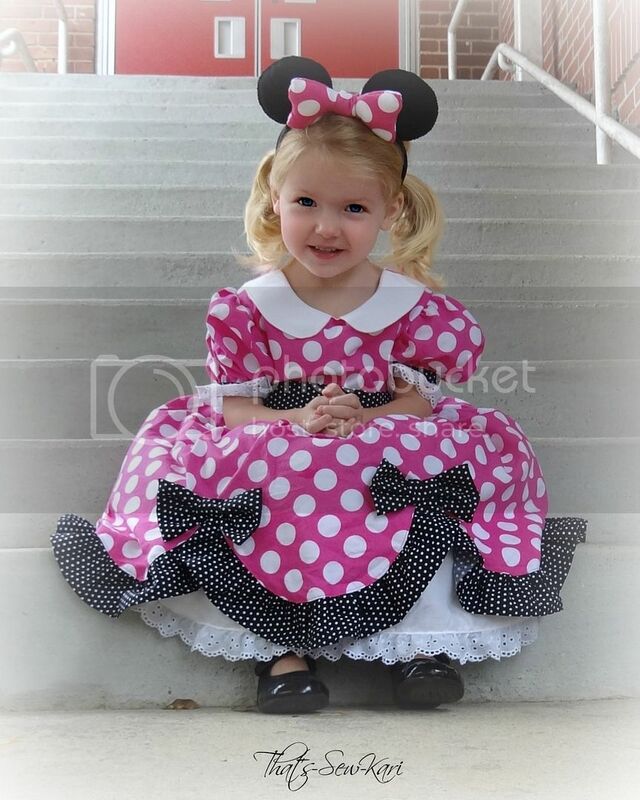 I tried it on my daughter and it fit perfectly! My mind is still racing through possibilities of this skirt – some playful, some sophisticated and glam. I may never look the same at another triangle again! 1. Pattern pieces are nested, in color and require at most 4 printed pages. 2. Pattern pieces lined up perfectly across the pages and are well labeled. 3. 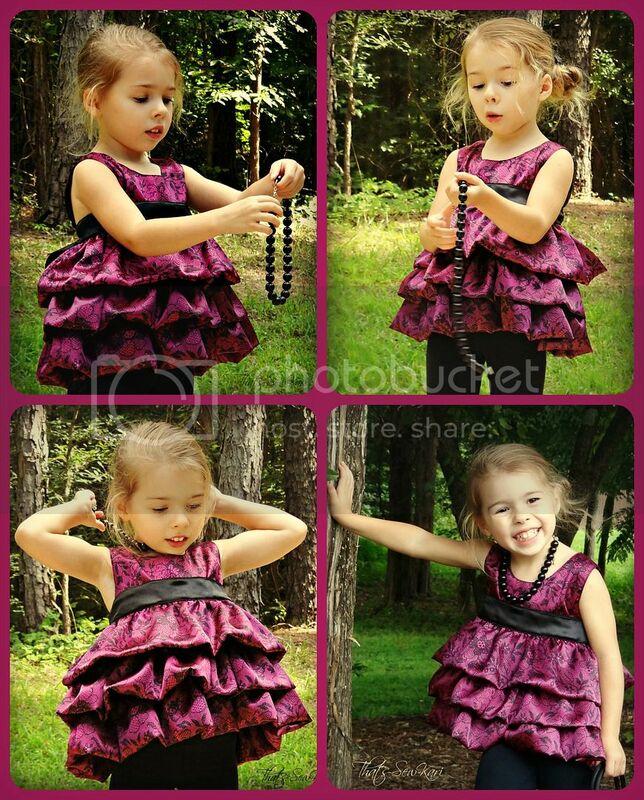 The tutorial portion of the pattern has step-by-step directions, clear pictures and is easy to follow/understand. 4. There is a size chart at the beginning of the pattern along with an adjustable waistband to ensure the best fit. 5. It comes with a doll sized pattern! 6. For a limited time, it comes with Rockabilly Head Band pattern as well (not shown as I haven’t sewn mine yet!). 7. 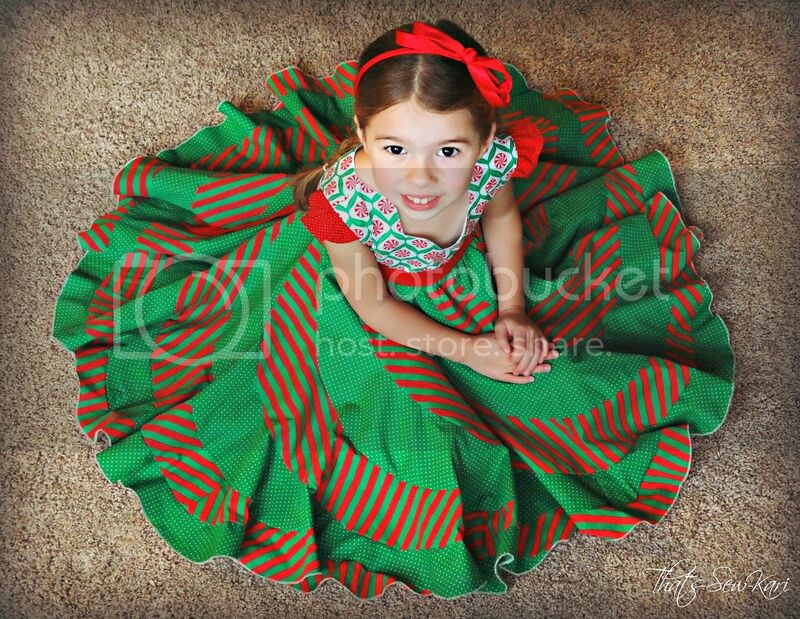 This pattern allows you to use your imagination and create a truly one-of-a-kind skirt. This pattern is offered at Little Lizard King in two sizing bundles or you can pick up the whole set at a discounted price! I haven’t had a chance to sew up the doll version, but I can’t wait to surprise my daughter with a Candy Corn Retro Glam for her doll, Willow! If you like what you see, but feel like skipping the work, I have these skirts listed in my Etsy shop, That's-Sew-Kari! 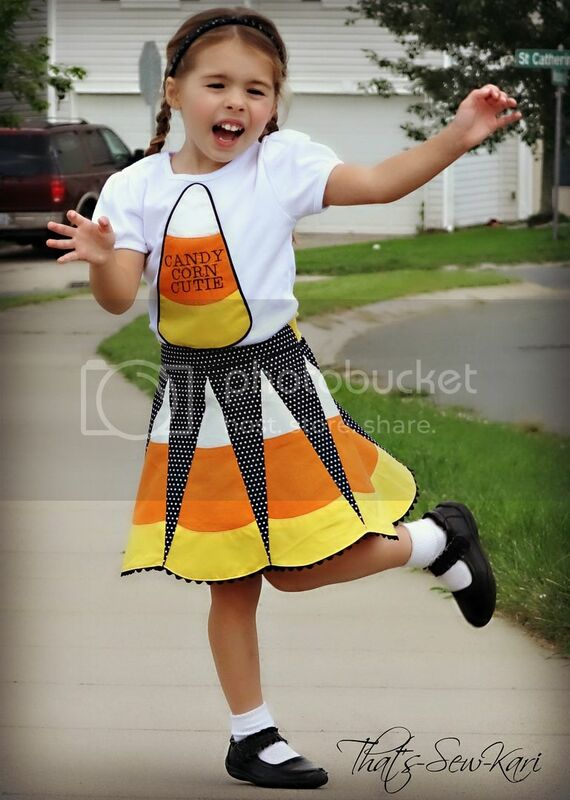 I can either create a Candy Corn Cutie edition or something entirely custom for you; just send me a message on Etsy. If you'd like, you can also follow me on Facebook! A special thanks to Tricia Boyer of Little Lizard King – this skirt was beyond epic and I can’t wait to see what’s next!